The global coffee packaging market is expected to see remarkable growth throughout the forecast period, primarily due to the increase in demand for coffee in institutional sales such as hotels, restaurants, office cafeterias, and others. Coffee packaging keeps coffee fresh for longer time and has a direct impact on the taste of the beans. In addition, every coffee producing company needs to distinguish itself from its competitors and packaging is one of the easiest ways to achieve it. The companies are thus striving to introduce innovative, airtight, and attractive coffee packages since recent past. Manufacturers in coffee packaging market are inclined more towards making their products user friendly. They are taking efforts in promoting their packaging products in diverse geographies, without any language barrier. In addition, due to the growing concern towards obesity and other health problems, the demand for functional beverages such as ready-to-drink (RTD) coffee is recently gaining popularity worldwide. Owing to its low calorie content, there are increasing chances of bolstering adoption of ready-to-drink coffee in near future. Major coffee packaging types include pouches, side gusseted bag, block bottom bag, stick pack, bag in box, bottles, cans, containers & boxes, sacks, and others. The pouches segment is further classified into stand up pouches and flat bottom pouches. Among all these segments, sacks and side gusseted bags are the key packaging types. Based on material type, the coffee packaging can be divided into plastic, metal, glass, paper and paper board, and others. The plastic segment is further classified into Polyethylene, Polypropylene, and Polyethylene Terephthalate. On the basis of distribution channel the coffee packaging market is classified into institutional sales and retail sales. Institutional sales segment is expected to dominate the global coffee packaging market by value share of over 62% by 2027 end. Paper and paper board is expected to be the fastest growing material type segment during the forecast period. This segment is also expected to dominate the overall global coffee packaging market. Plastic is anticipated to be the second largest material type segment. PET provides a much better packaging solution for the various types of coffee available on the shop shelves such as whole or pre-ground beans as well as soluble coffee powder and granules. The advantages of PET jars include their light weight, virtually unbreakable nature, and re-sealable benefit. They are also available with wide necks for easy pouring and spooning, and the design possibilities are also unending. All these factors are expected to make this segment highly lucrative over the forecast period. The global market has been segmented into five regions, i.e. North America, Latin America, Europe, Asia Pacific region (APAC), and Middle East & Africa (MEA). Europe dominates the global coffee packaging market by value and volume. The demand for coffee is huge in this region, as a large number of people prefer consuming coffee on a daily basis. Germany is the major contributor in the European coffee packaging market. The Asia Pacific region is anticipated to expand at a lucrative CAGR of 6.6% during 2017-2027, led by India and China as the major contributors. The RTD coffee is one of the major soft drinks category in Japan, and over half of global sales still occur there. This is expected to drive the demand for coffee packaging market in this region. Many countries around the world are increasingly implementing strict laws and regulations regarding coffee packaging. For instance, recent packaging directives from European Commission have led to the obligation of challenging targets for recycling, and national governments are also observing new ways to discourage packaging waste. Key players in the global coffee packaging market include Amcor Limited, WestRock Company, Bemis Co Inc., Mondi PLC, DS Smith PLC, ProAmpac LLC, Graham Packaging Company, L.P., Pacific Bag, Inc., Crown Holdings Inc., Goglio S.p.A., Novolex Holdings, Inc., Sonoco Products Company, Co Pack, Inc., Sixto Packaging, PBFY Flexible Packaging, Dongguan Min Lee Packaging Materials Co., Ltd, Color Hoyo Paper & Plastic Products Co., Ltd, Dongguan Jmei Packaging Company Limited, Qingdao Dejili Packing Material Co. Limited, Shenzhen Packmate Packaging Co., Ltd. among others. Transparency Market Research examines the global coffee packaging market for the forecast period 2017-2027. The primary objective of the report is to identify opportunities in the market and present updates as well as insights pertaining to various segments of the global coffee packaging market. 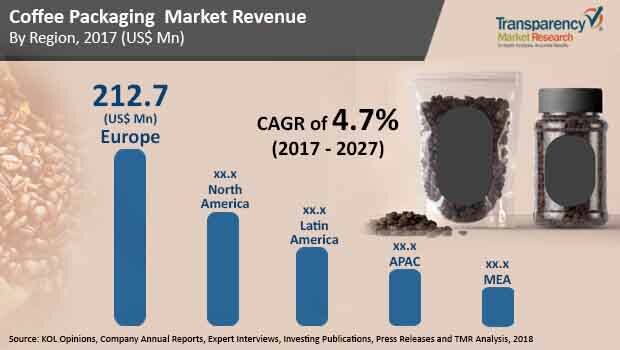 The report begins with an overview of the global coffee packaging market, evaluating market performance in terms of revenue, followed by TMR’s analysis of key trends, drivers, and restraints witnessed in the global coffee packaging market. Impact analysis of key growth drivers and restraints based on the weighted average model is also included in the report. To compute the market size, in-depth secondary research has been done. Data points such as regional splits and market split by packaging type, material type, by distribution channel, and by region have been assimilated to arrive at the market estimates. The report comprises the forecast of the global revenue generated by sales of coffee packaging market. TMR triangulates the data via different analysis based on supply side, demand side as well as dynamics of coffee packaging market. The analysis does not only conduct forecasts in terms of value, but also evaluates the market on the basis of essential parameters, such as Year-on-Year (Y-o-Y) growth. This helps providers to recognize the future opportunities as well predictability of the market. In order to understand and assess opportunities of this market during the forecast period from 2017-2027, the report is categorically divided into four key sections on the basis of by packaging type, material type, by distribution channel and by region. The report analyses the global coffee packaging market in terms of value (US$ Mn) and volume (Tonnes). A vital feature of this report is the analysis of the global coffee packaging market by packaging type, material type, by distribution channel, and by region; and the corresponding revenue forecast in terms of absolute dollar opportunity. This is traditionally overlooked while forecasting the market. However, absolute dollar opportunity is critical in assessing the level of opportunity that a provider can look to achieve as well as to provide potential resources from sales perspective of the global coffee packaging market. To understand key segments in terms of their growth and performance in the coffee packaging market, Transparency Market Research has developed a market attractive index. The resulting index should help providers identify existing market opportunities in the global coffee packaging market. In the final section of the report, the global coffee packaging market’s competitive landscape has been included to provide a dashboard view of companies that manufacture and provide coffee packaging related services. The report contains company profiles of some of the players in the coffee packaging market. Key players in the global coffee packaging market include: Amcor Limited, WestRock Company, Bemis Co Inc., Mondi PLC, DS Smith PLC, ProAmpac LLC, Graham Packaging Company, L.P., Pacific Bag, Inc., Crown Holdings Inc., Goglio S.p.A., Novolex Holdings, Inc., Sonoco Products Company, Co Pack, Inc., Sixto Packaging, PBFY Flexible Packaging, Dongguan Min Lee Packaging Materials Co., Ltd, Color Hoyo Paper & Plastic Products Co., Ltd, Dongguan Jmei Packaging Company Limited, Dejili Packing Material Co. Limited, and Shenzen Packmate Packaging Co., Ltd. among others.